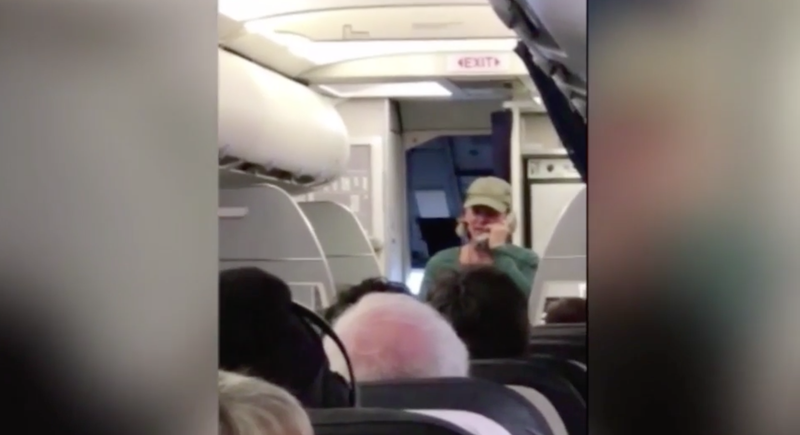 Rather than your typical “Hi, welcome aboard United Airlines Flight whatever, remember to put your oxygen mask on before assisting others” greeting, a pilot in street clothes welcomed passengers aboard Saturday with a rant on politics and her divorce. Just another reason why it’s always fun to fly the friendly skies! According to CBS News, all of this occurred on United Airlines Flight 455 from Austin to San Francisco before the plane took off. (What is it about plane transit between Austin and San Francisco that makes people act wildly out of line?) CBS News reports that the pilot outburst led to a delay of about two hours, which is exactly what every airline passenger wants to happen during an already long travel day. A snippet of the pilot’s intercom address can be seen over at the Sunday Express, during which a man gets up to leave the plane while the pilot adamantly argues that she didn’t offend several of the other passengers still in their seats. She then used the plane’s overhead PA system to rant about President Trump and Hillary Clinton — calling them both “a–holes” and then ranting about her divorce. That’s when passengers began tweeting to United to get a new pilot. United Airlines found a replacement pilot for the flight and it finally got going. An airline spokesperson, Charlie Hobart, said he didn’t know why the pilot was allowed on the plane in street clothes without any raised eyebrows. Reiss said the pilot was escorted off the plane by uniformed officers, and he could see that she had been crying. As she was escorted away she turned back again, toward him. Hobart also said the company will be discussing the ordeal with the pilot—let’s just hope no one brings up the governing of our nation or anything like that.